Imagine awakening each morning to the sound of the gulls and the surf. Opening your eyes only to view the spectacular blue-green Gulf waters before you lift your head from the pillow. You get up and step out the private sliding glass door from your bedroom and find yourself on a beautiful wrap-around deck that provides panoramic views of the entire 30A area beaches from Rosemary’s beach to Seaside and the lakes and houses in between. You notice ample high tables and chairs on the deck for coffee or dining and all other forms of relaxing while watching the dunes, the gulf and dolphins playing in the crystal clear water of the gulf. Then you think back to the previous evening, when your friends and family sat on the deck and watched the sun set into the water, like a big orange ball falling into the water, until the clouds lit up with brilliant colored lights and then continue to change as the sun signaled the end of another beautiful day on the Florida white sand beach. Then you remember, wait, I can walk right down from my deck right over the dunes and be on the beach in a matter of seconds. You again think you are dreaming. But, it is not a dream. It’s real and it happens every day when you book your vacation at “Top Shelf”, a penthouse Condo in the Sugar Dunes complex in the heart of Seagrove Beach. This is a true beachfront condominium. Located right over the dunes that offers fabulous unobstructed, panoramic views of the Gulf from the living area, dining area, kitchen, and master bedroom. It is amazingly large, 1,600 square foot, 3 bedroom, 3 bathroom residence on the 4th (and top) floor of the Sugar Dunes complex, and is decorated with great furnishings to be comfortable and enjoyed. It`s not just a rental - it`s a home and one the owner enjoys herself many weeks in the fall and winter. The kitchen, dining room and living room are part of an open floor plan with plenty inside and outdoor dining and seating which truly creates an air of comfort. The private furnished balcony wraps around the southwest corner letting you enjoy endless hours of people and dolphin watching, while sipping drinks and all in the cover shade and vaulted ceilings but in supreme closeness to food preparation and air conditioning. The living room not only offers endless Gulf views but also has vaulted ceilings and provides a large flat screen television for those movie and game enthusiasts. You’ll find a small built in wet bar for special drink preparations so you won’t get in the way in the kitchen even though there is plenty of room and extra sink and ice maker is nice. In the kitchen you also can prepare the meals while looking at the water and finding whatever you need in the gourmet kitchen fully equipped with granite counter tops, mirror glass tile backsplashes and stainless steel appliances. We thought of everything and the kitchen is well equipped with many pots and pans and other items gourmet chefs might use so don’t be surprised. The master suite offers awesome views and sounds of the Gulf and opens directly to the balcony. The cream colors and styles of the Orient reflect its serene environment. The spacious bedroom has plenty of storage and leads to the master bathroom that is also extra spacious with a walk in shower and walk in closet....and his and her sinks. The second bedroom has a king bed and large flat screen television as well as plenty of storage and a smaller closet, but a full private bathroom. The third bedroom has a queen sized bed and has lots of storage and large closet along with the private bathroom. 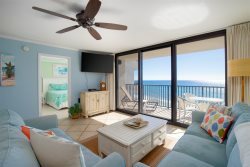 There is an elevator and private gated parking on the north side so you will be very close to your car and the benefits of the 30A surroundings. Just remember its not a dream it is the `Top Shelf`, the Penthouse at Sugar Dunes in Seagrove Beach. Includes 2 chairs and 1 umbrella for rentals between Mid March and Mid August. Very quick to respond to questions, especially since we were coming in right after hurricane Michael passed thru. Ann is Awesome! :) Extremely pleasant staff, very helpful, knowledgeable on the area and quick to answer any questions you have about your stay. Gorgeous sunsets, private beach, huge roomy wrap around deck and perfect set up for a large family or multi-family rental. We will be back! We have been renting in the area for about 10 years and this is easily one of the best units we have stayed in. Great customer service. Very detailed instructions, and what to expect during the stay. Very informative, and quick to reply. They were always helpful, and available to answer questions via email and phone. The condo was beautiful, and supplied your every day items to use during the stay. The view was amazing, and the deck had great outdoor seating for everyone to enjoy. The property was well-maintained. Beach chairs and umbrellas were set out early in the morning. Overall, it was a great vacation rental. The area was beautiful, and we look forward to our next stay. We thoroughly enjoyed our stay! Wonderful place! Beautiful inside and loved the extended balcony! Very quiet and private. Myer Properties is a dream team.So easy to work with. So accommodating. Everything is so well planned . We wouldn't use any other co.when planning a trip to the 30a area. We have stayed in this condo several years now. Always top notch. Very pleasant, experienced team worked with me before , during and after our stay. Our week at Top Shelf was just perfect. Sugar Dunes will be our go to spot in the future . They were very prompt in response to my inquiry and worked with me on our last minute reservation. "Top Shelf" is the perfect name for this condo! The pictures do not do this unit justice. The view from the kitchen and living room is simply stunning. We have staying at many homes in the area and none of them had a view like this. The condo itself is nicely decorated and they have made some very nice upgrades. We hope to be back again next year!